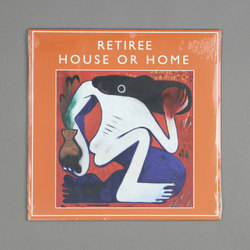 Retiree - House Or Home. Vinyl LP. Bleep. Aussie group Retiree return to Rhythm Section International (FYI Chris, Chaos In The CBD) to drop their debut LP. House Or Home sees the trio meditating on notions of identity and belonging over a series of dreamy synth-pop tunes. The likes of ‘Migrate’ and ‘Magic Eye’ are tender r&b tracks of the sort that Dev Hynes has mastered over the past couple of Blood Orange albums. Throw in an additional air of Balearic wistfulness and you have yourself a winning album. ‘Mystery Bay’ also introduces a house element that is more in keeping with the dancefloor-centric vibe of many of Rhythm Section’s other releases.